Northwest UAV Propulsion Systems (NWUAV) was founded in 2005 by Chris Harris to produce highly efficient engine systems for the growing Unmanned Aerial Vehicle (UAV) industry. Today, NWUAV employs over 80 people at its headquarters in McMinnville, Oregon, and generates over $20 million in annual revenue. NWUAV builds engines for numerous models of UAV’s, which have several universal components. 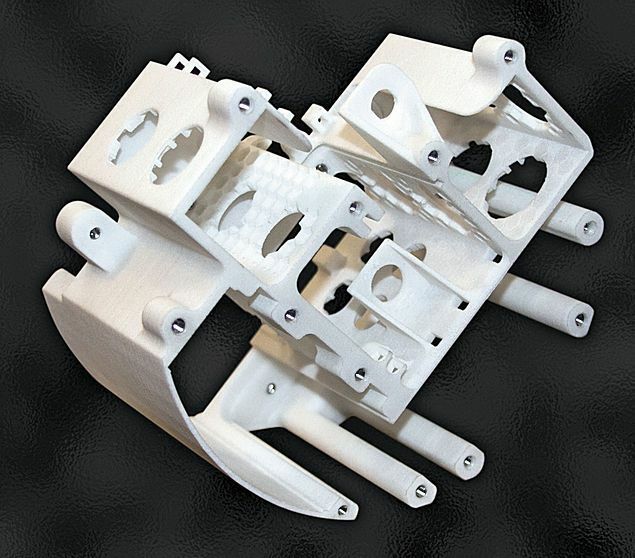 In 2014, NWUAV engineers designed a component “puck” that would hold these common parts and easily slide into the engine compartments of several of these models. This innovation greatly reduces assembly time on engines. NWUAV was working under a short timeline to produce completed engine assemblies. To meet this demand, the engineering department wanted a rapidly-produced prototype to be able to physically check the fit and function of the puck, which has a complex geometry. SLS additive manufacturing was chosen to create the prototype and two bureaus were tapped to produce the parts: NW Rapid Mfg, LLC and a large service bureau out of state. The large bureau produced a puck that came in on the high side of NWUAV’s tolerances. It was noted to have surface defects in the form of “orange peel”, which is indicative of low quality powder. The part appeared to have been hand sanded to improve the finish. The engineering team also noted the part was stiff, the features had poor resolution and most importantly, it weighed 159 grams. NW Rapid Mfg, LLC built the component puck on an EOS P7-series machine using EOS PA2201. With no change to the 3D file, NW Rapid produced an accurately-dimensioned puck with a high quality smooth finish, good flexibility, and a “crisp” appearance. Most importantly, the puck weighed in at only 148 grams.